It took both brawn and brains to move a beautiful (and hefty) treasure when the Magna Carta display was moved from the Capitol Rotunda to its new home in the Capitol Crypt. 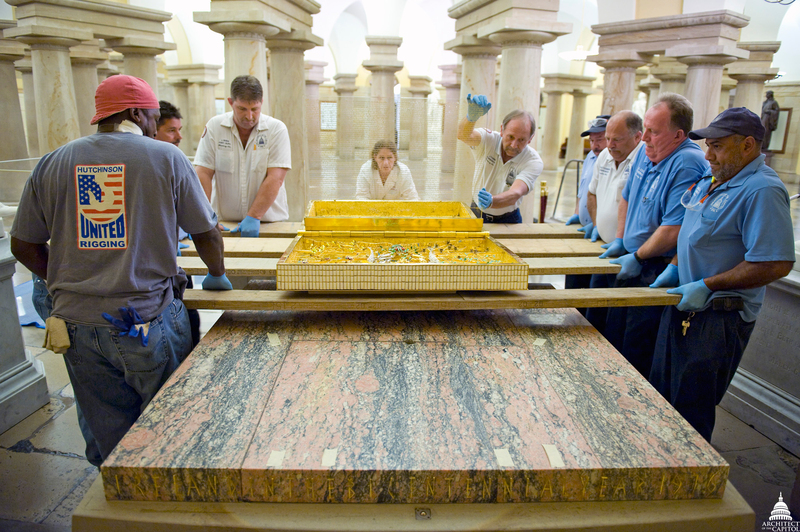 In August, the Architect of the Capitol's (AOC) Capitol Building Mason Shop, with the support of a rigging company, spent 14 ½ straight hours — from 5 p.m. until 7:30 a.m. — moving the fragile presentation case to a secure storage room for conservation, and the stone pedestal to its new location in the Crypt for cleaning. Challenges — those identified and unforeseen — were continuous. The gilded and bejeweled presentation case was both heavy (weighing in at 800-pounds) and extremely delicate, necessitating that the workers take extra care during its relocation. The work also required that the stone pedestal, made of pegmatite stone on top and Yorkshire sandstone on the base, be separated and tilted to pass through the U.S. Capitol's doorways. "We were surprised by just how difficult this job turned out to be," said Jeff Thorne, supervisor of the Mason Shop. The pedestal's bulkiness combined with the rigging requirements created a very challenging situation for the workers. The Magna Carta display is a unique piece in the Capitol's collection of artwork and was a gift from the Parliament of the United Kingdom. It was presented at an elaborate ceremony to celebrate the U.S. Bicentennial in 1976. The Crypt provides an appropriate sense of scale for the display and its new location places it in a more suitable historical context. "Its neighbors now include statues from the National Statuary Hall Collection that are from the 13 original states," noted Dr. Barbara Wolanin, AOC curator. Six of these statues represent people associated with the Declaration of Independence — a document that traces its roots to the original Magna Carta that was sealed in 1215 by King John of England. Conservation of the inside of the display. Once the presentation case and stone pedestal were moved, the detailed work began. 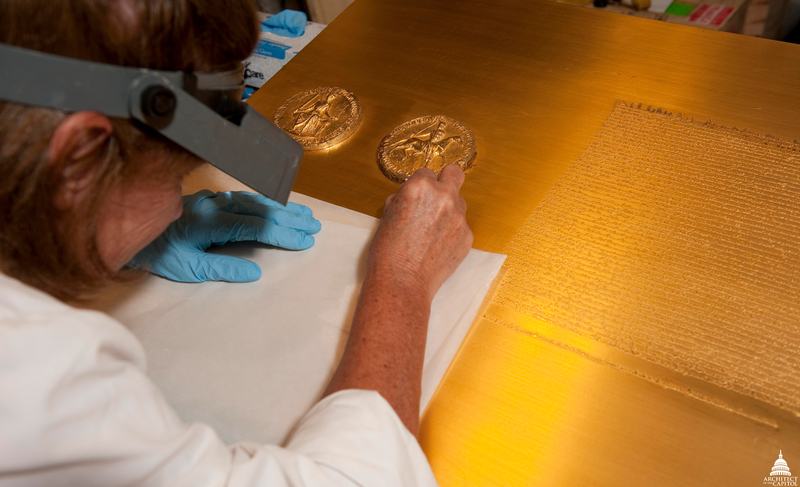 A conservator spent 2 ½ weeks performing a full cleaning of the presentation case, including making necessary repairs. The ornate gold panel and two medallions, depicting the seal of King John, were meticulously cleaned with a small amount of calcium carbonate powder and a cotton swab. Conservation of the outside of the display. 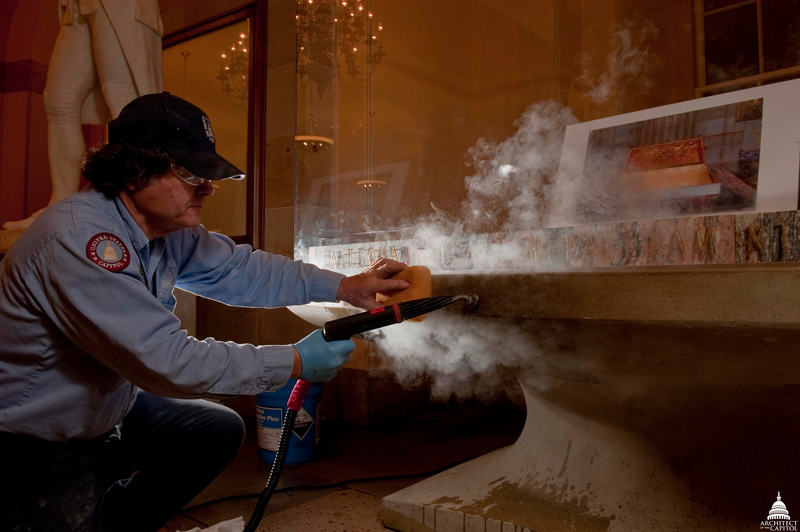 The Mason Shop workers cleaned the Plexiglas cover both inside and out, and then expertly "steam cleaned the stone to remove the dirt and hand oils that had built up over the years," said Thorne. The AOC Capitol Building Mason Shop successfully relocated the Magna Carta display to the Crypt. The final work included replacing the presentation case back on the stone pedestal. Then, working together, the Stone Mason crew lifted the large Plexiglas cover and replaced it on the entire display. "We are pleased that visitors to the Capitol can continue to enjoy the Magna Carta display and learn how the document helped form the foundation of our government," said Dr. Wolanin. Louis Osman, the man who designed and created the Magna Carta display, also made the crown for the investiture of Prince Charles, Prince of Wales. Pegmatite, a type of volcanic stone that the Magna Carta presentation case sits on, is believed to be over three billion years old — dating back to the time when Europe and North America were physically joined. The sandstone pedestal is made of stone from Yorkshire, England, and was chosen to match the Virginian sandstone that covers the walls in the Rotunda and Crypt. This story is also published in the Winter 2010 issue of AOC's Foundations & Perspectives.